Outside of one poor decision (that resulted in a pick), it was a good day for Kirk Cousins even if his receivers were not firing on all fronts. Cousins looked in control throughout, and while the stat sheet will credit him a fumble, that was all on Dalvin Cook. The offensive line was much maligned before the season, but Mike Remmers was particularly impressive in the run game, where he generated plenty of movement while exhibiting lots of control in his blocks. While Danielle Hunter (who was excellent) will receive most of the headlines for his scoop-six, usual backup Stephen Weatherly had himself a day, as he chiefly worked over Taylor Decker with what is surely the best game of his young career. Tom Johnson got to the quarterback twice and was part of a rotation that could not be stopped. Perhaps the only player who didn’t get in on the fun was Linval Joseph, who had a quiet day by his standards, trading blows with Graham Glasgow. It doesn’t matter what uniform you put him in; when Damon Harrison is on the field, thou shalt not run (past his gap anyway). He controlled the A gaps with a number of defensive stops. One player who didn’t help the team all that much was Teez Tabor. The former Florida cornerback had an extremely rough outing despite only playing 14 snaps. It was a really rough day for Decker, which makes you wonder how hurt he was in the game. 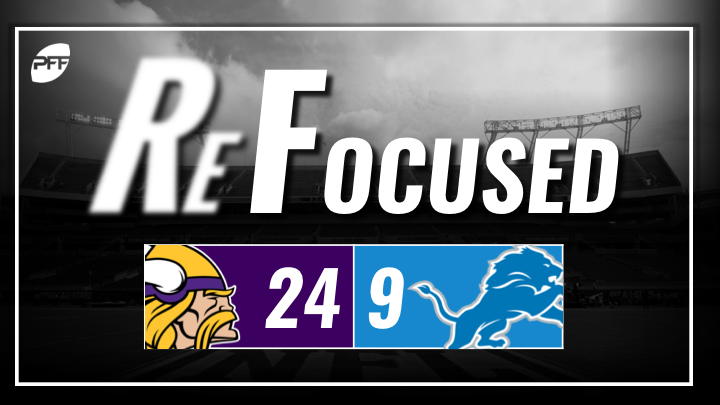 He epitomized a Lions line that struggled all day to win its one on one matchups but, more pertinently, pick up the relentless stunts the Vikings were running all game long. While not his best game, it’s a credit to Matthew Stafford that he was able to see out a game where he received punishment after punishment after punishment. It was tough sledding throwing the football with most of his stat padding coming on underneath stuff against a Vikings coverage unit that won the day. The offense stuttered, but a suffocated performance by their defense (especially their defensive line) meant the result was never in doubt. The offensive line’s complete inability to pick up the Vikings stunting front led to a disastrous day in pass protection.